Your offspring can learn a lot during your holiday together in our family hotel in the Allgäu. From horseback riding to skiing and diving - we make your kids real sports pros. Nowhere else the kids can learn to ride with such a beautiful view as in our family hotel in the Allgäu. Our FN-certified pony stable is located ca. 100 meters from our reception. Here, our 8 ponies and 5 sweet Haflingers are waiting for the kids and teens from 6 years old, who are not afraid of horses. They all become real riding pros here. We also offer private lessons for beginners or advanced. 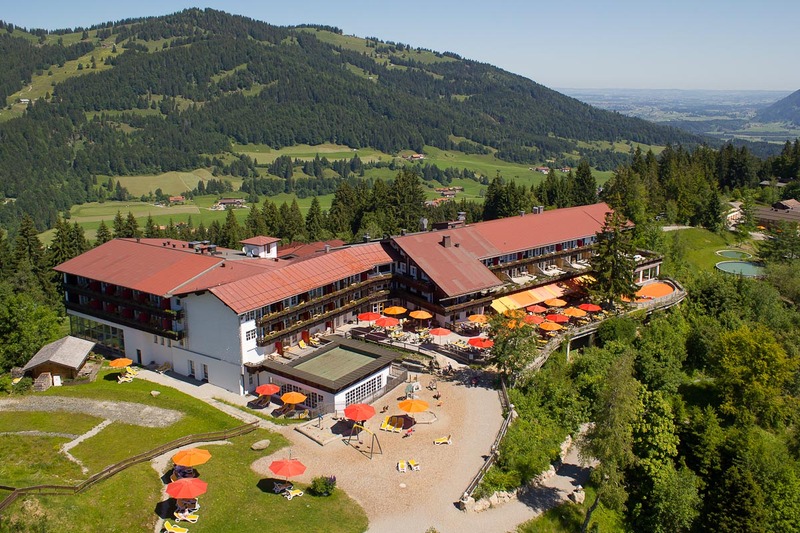 You can daily make a free lunge-round in our family hotel in the Allgäu. In Froschi's riding kindergarten the younger children can gain their first experience with horses. Kids and teens from 8 years can participate in Froschi's riding camp, a multi-day workshop with theory and practice. Caps are available for free of course and also the parents can book a riding course in our family hotel in the Allgäu and enjoy "wellness on the horseback". Directly in front of the Allgäuer Berghof is our ski school with the children's ski area. Here, all beginners learn easily how to swing their turns over the slopes - as early as three years. You are always accompanied by our trained instructors and of course ZIMI, the ski school mascot. Our three children's ski areas are exclusively reserved for guests of the Allgäuer Berghof. Of course, there are also group and private courses for adults who want to learn skiing, snowboarding or cross-country skiing. In the children's swimming school of our family hotel in the Allgäu, your little ones from 5 years old learn how to move easily in the water under the experienced supervision of our qualified swimming instructors. At the end of the holiday week the award "seahorse" awaits the diligent swim pupils. Every year over 200 children learn to swim during their holiday in our hotel. We also offer diving lessons for teens in our indoor pool in cooperation with diving school "Schildkröte" from Sonthofen. Your kids will learn the basic skills for safe and adventurous diving. The warm water pool of our new Family-Spa with its comfortable 33° C, almost invites to baby swimming courses. Your baby gets playfully familiar with the element of water and all senses will be stimulated in a variety of ways. Due to the weightlessness in the water, your darling can move easily without difficulty and, at the same time, the child trains its motor skills and body control. Toddlers also benefit from the movement in the water. It prepares them playfully for swimming, so that fears of the element of water can not even arise. Within the scope of our child care, we offer climbing courses in our new boulder cave with climbing tower. Here both, large and small spider monkeys, can prove their skills. Even small breakdowns remain without consequences here, due to the use of soft floor mats. Thanks to the many varied elements of our scrambling parcours, climbing enthusiasts can always face new challenges here. At our house your family holidays will be full of adventures. Whether playgarden, water playground, mountainbiking or hiking - there are countless possibilities for every age-group to experience nature around the Berghof area.